The Home Office has been criticised for posting a message on social media urging EU nationals to apply “if they want to stay in the UK” after Brexit. The tweet, sent on Thursday, tells EU citizens that they will need to confirm their status to “continue living in the UK after 31 December 2020”. It sets out how they can register for settled status and the cost involved. But critics said the timing of the campaign would go down badly while one MP said it was a “pay to stay” policy. Theresa May has said she wants all 3 million EU citizens currently living legally in the UK to stay after the UK leaves the EU, irrespective of whether the UK’s withdrawal agreement is passed by Parliament. An online system for EU nationals to register their details will open fully on 30 March 2019, hours after Brexit is scheduled to take place. EU nationals will have until 30 June 2021 to confirm their status. It will cost £65 for those over 16 and £32.50 for those under 16, although there will be no charge for those who already have indefinite leave to remain in the UK or permanent residence. People will have to have been resident before 31 December 2020, when the proposed post-Brexit transition period ends, in order to apply. All those who have been living continuously in the UK for five years will be eligible for settled status, giving them broadly the same rights as they have now. Anyone who has not be in the UK that long will be eligible for pre-settled status and be able to qualify for settled status once they have completed five years residence. The Home Office’s Twitter message briefly explains the registration process, which it insists will be as “quick and user-friendly as possible”, and the documentation people will need to provide. It states: “If you are an EU citizen living in the UK and want to stay in the UK after 31 December 2020, you and your family need to apply to the EU settlement scheme”. A campaign group called “the3million” said the timing of the message – posted two days after Christmas – was inappropriate at a time when EU nationals wanted to put their concerns behind them for a few days. And Labour’s Stella Creasy said the government was, in effect, pursuing a “pay to stay” policy. But Tory MP Chris Philp defended the message, saying Italy already required citizens of other EU countries living there to register if they were in the country for more than three months. In response to the criticism, the Home Office said it was vital that EU nationals understood what to do and were pointed to “reliable sources of information” on the government’s gov.uk website. “EU citizens make a huge contribution to our economy and to our society and we want them to stay,” a spokesperson said. The government has said there will be a presumption that all EU citizens will be granted either settled or pre-settled status if they have proof of identity and pass a criminal records check. 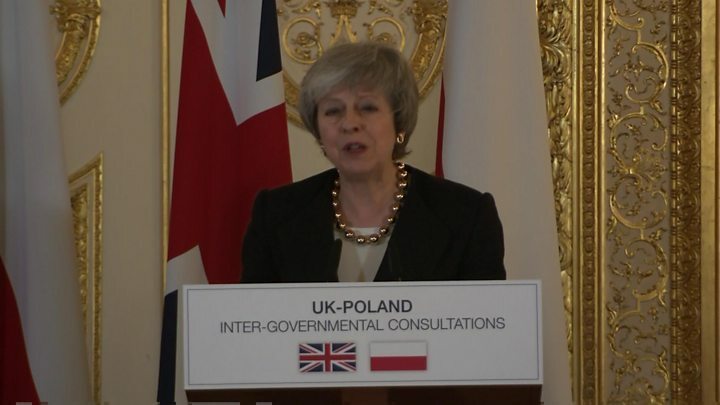 However, the prime minister has stopped short of guaranteeing the right of EU citizens to stay in the UK in the event of a no-deal exit. If the UK leaves without a deal, the EU has said a residence permit or a long-stay visa will be required for stays of more than 90 days. But the European Commission has said UK citizens who have lived in an EU state for a period of more than five years should be granted, subject to certain conditions, long-term resident status.